“Je pense, donc je suis” wrote René Descartes in 1637. That's French for "I think, therefore I am." Following Mr. Descartes logic, if you cannot think well, then you are not well and cannot live life fully. So, the question is, "How can you protect our brain and well-being?" Many recent studies have shown certain supplements may enhance memory function, increase cognitive ability, and help prevent Alzheimer's disease. Following is a list of supplements for improving and keeping your smarts. Click on the supplement name to see prices. Each link leads to a reputable online store's product description. To choose the store, we evaluated several stores and chose the lowest cost product among reputable manufacturers. Or, use the ChampHealth Buyer's Guide to do a cost comparison yourself. If you are in a low-risk group or have no predisposition for Alzheimer's disease, you probably have other health supplementation of equal or greater priority. If so, it may not be practical to take all the supplements on the list above. In such case, you could take one herb in the morning, such as ginkgo, and one non-herb supplement in the afternoon, such as Acetyl L-Carnitine. If you are in a high risk group, consider taking more than two supplement types, increasing the dosages, and printing this page for your physician and seeking his or her guidance. 1Circumin is not cumin. They are totally different with no relationship to each other. The hyperlink for curcumin to the Vitaminshoppe product page does not indicate that the Planetary Formulas 60 tablet product has 450mg of curcumin extract per tablet. "True to its name, sage may prevent cognitive decline by protecting cells and inhibiting the breakdown of acetylcholine, a brain chemical crucial for memory and thinking. A small trial published in 2003 found that sage oil capsules improved memory and attention in people with Alzheimer's disease. A later study of healthy young adults found that the pills boosted cognition and mood." When shopping for sage for consumption, be careful not to choose sage oil for external use or aromatherapy, such as that made by Auracacia. 3Several studies show that having one alcoholic beverage per day, but no more, provides protection against than Alzheimer's. Further, one study showed that those who drank more than one alcoholic beverage per day had a 7 percent higher level of a chemical linked to Alzheimer's disease risk. Those who totally abstained from alcohol consumption had even higher levels. (source: Men's Health, April 2005) Conclusion: Have a balance in life—nothing to excess. The two brain scans on the left are of normal brains. 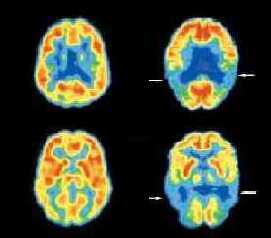 The two brain scans on the right are of brains in patients with Alzheimer's disease.